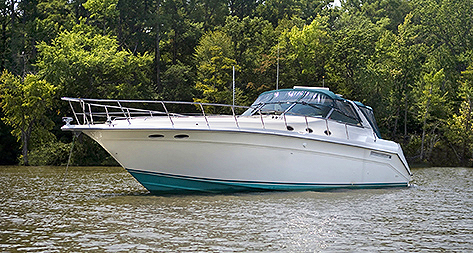 With a lee shore nearby, this Sea Ray needs a reliable anchoring system and a skipper who is familiar with how to anchor safely. Anchors dig into the seabed to hold a boat in position. They serve a safety role by keeping boats out of the surf or off the rocks. They also allow boaters to secure the boat temporarily while fishing, having lunch or spending the night. When an anchor penetrates the surface of the seabed, suction generates resistance, created by the bottom material plus the weight of the material above the anchor. As the boat pulls on the anchor rode, the anchor digs in deeper, creating additional resistance. In rocky or coral bottoms, anchors can't dig in, but rather snag on protrusions and hold precariously. To ensure that an anchor "sets" well, apply tension to the rode so the anchor penetrates the bottom. Do this by making fast the line and applying power in reverse. If your boat moves, reset the anchor and try again. Many boaters make only a half-hearted attempt to set the anchor by putting the boat in reverse for just a few seconds. To be sure the anchor is set you must put a reasonable strain on the rode for a reasonable length of time. Your boat should surge forward when you back off the power, indicating that you have put some strain on the rode to test the anchor set. We know of no way to ensure that your anchor will hold other than by pulling on it hard. Scope is defined as a ratio of the length of an anchor rode from the bit to the anchor shakcle and the depth of the water under the the bow of the boat measured from deck height. Most anchoring texts and anchor manufacturers agree that a scope of 7:1 achieves the anchor's designed holding power, and more scope is better than less. In theory, 7:1 scope is great, but at a crowded anchorage most cruisers scoff at the idea of paying out more than 3:1 or 4:1; there just isn't that much space for boats to swing. When an anchor is securely set you can consider shortening scope in a crowded anchorage. Once an anchor has been set, it will almost always hold the same amount of tension that was used to set it, even if the scope is reduced. This means that you can pay out long scope, pull hard on the anchor rode using the engine, and then shorten scope to reduce swinging room. However, if your boat swings and the anchor has to reset itself, it will have to do so at a reduced scope. This is known as Anchoring Russian Roulette. If you have an anchor alarm on your chartplotter, set it so it alerts you if the boat swings too far from the position where it was when you set the anchor. If you have an electronic compass or autopilot, set the course alarm so it alerts you if the boat's heading changes radically. If you have alarms on your depth sounder set maximum and minimum alarms to alert you if the water depth changes significantly, indicating that you are drifting either away from or towards the shore. Stand an anchor watch. It is a good practice to take bearings on prominent landmarks when you anchor so you can detect any subsequent change in position. In tight anchorages, you may need to limit your boat's tendency to swing at anchor. By dropping an anchor close to the beach and a second anchor in the opposite direction, you can locate the boat precisely in the anchorage. You can also use the tension on one rode to help set both anchors. Bob Ogg, co-inventor of the Danforth anchor, recommends setting one anchor into the wind or current, and a second anchor 180° away. Then take both lines to the bow of the boat. This allows the boat to swing around in a relatively small arc, yet will allow the boat to pull against an anchor without causing it to reset when wind or current change. Anchors need to develop enough resistance in the seabed to withstand the environmental forces on the boat—the wind and the waves. An anchor's ability to develop resistance is entirely dependent on its ability to engage and penetrate the seabed. We have participated in several anchor tests, and despite varying results, there always seems to be one undeniable conclusion: the selection of a suitable bottom for anchoring is a much more critical factor than the design of the anchor. So how do you choose the right anchor design? You must take expected bottom conditions into account. Here is an analysis of potential options, based on the seabed. Fortress Anchors are highly regarded for their holding ability in soft bottoms. Fine-grained sand is relatively easy for anchors to penetrate and offers consistently high holding power and repeatable results. Most anchors will hold the greatest tension in hard sand. Best in sand are the lightweight Danforth-style anchors like the West Marine Traditional and Fortress anchors. Mud has low sheer strength, and requires anchor designs with a broader shank-fluke angle and greater fluke area. This allows the anchor to penetrate deeply to where the mud has greater sheer strength, and also presents more surface area in the direction of pull. Mud is frequently only a thin layer over some other material, so anchors that can penetrate through the mud to the underlying material will hold better. Fortress anchors have superior holding power in mud, because they can be converted to a broad fluke angle. Holding power is more dependent on where you happen to drop the hook than on the type of anchor you have. Plow-shaped or grapnel-type anchors, with high structural strength to sustain the high point loads generally work the best. These include the Bruce, CQR, or Delta, as well as the old-fashioned Fisherman style anchors. Tough bottoms for all anchor designs. The weight of the anchor, more than its design, may be the most important factor in penetration and holding power. CQR and Delta anchors are thought to be good due to their ability to penetrate the vegetation. However, these conditions have a high probability of false setting, due to the anchor catching on roots and protrusions, rather than something solid. 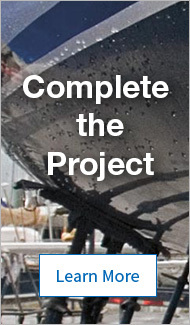 Inspect your entire anchor system frequently for chafe, loose shackles, and bent flukes. The system is only as reliable as its weakest component. Store at least one anchor so that it can always be used immediately. Even the strongest anchor won't do you any good if you can't deploy it. Quickly deploying even a small anchor can keep you from going further aground.